The humblest is the peer of the most powerful. The law regards man as man, and takes no account of his surroundings or of his color when his civil rights as guaranteed by the supreme law of the land are involved. Our Constitution is color-blind, and neither knows nor tolerates classes among citizens. In respect of civil rights, all citizens are equal before the law. ... We boast of the freedom enjoyed by our people above all other peoples. But it is difficult to reconcile that boast with a state of the law which, practically, puts the brand of servitude and degradation upon a large class of our fellow-citizens, our equals before the law. 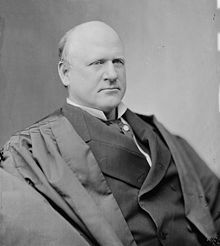 John Marshall Harlan (1 June 1833 – 14 October 1911) was an American lawyer and politician from Kentucky who served as an associate justice on the Supreme Court. He is most notable as the lone dissenter in the Civil Rights Cases (1883), and Plessy v. Ferguson (1896), which, respectively, struck down as unconstitutional federal anti-discrimination legislation and upheld Southern segregation statutes. These dissents, among others, led to his nickname, "the Great Dissenter." He was the grandfather of John Marshall Harlan II. An English historian, contrasting the London of his day with the London of the time when its streets, supplied only with oil-lamps, were scenes of nightly robberies, says that "the adventurers in gas-lights did more for the prevention of crime than the government had done since the days of Alfred". A Chinaman can ride in the same passenger coach with white citizens of the United States, while citizens of the black race in Louisiana, many of whom, perhaps, risked their lives for the preservation of the Union, who are entitled, by law, to participate in the political control of the State and nation, who are not excluded, by law or by reason of their race, from public stations of any kind, and who have all the legal rights that belong to white citizens, are yet declared to be criminals, liable to imprisonment, if they ride in a public coach occupied by citizens of the white race. He does not object, nor, perhaps, would he object to separate coaches for his race if his rights under the law were recognized. But he objecting, and ought never to cease objecting, to the proposition that citizens of the white and black race can be adjudged criminals because they sit, or claim the right to sit, in the same public coach on a public highway. If evils will result from the commingling of the two races upon public highways established for the benefit of all, they will be infinitely less than those that will surely come from state legislation regulating the enjoyment of civil rights upon the basis of race. We boast of the freedom enjoyed by our people above all other peoples. But it is difficult to reconcile that boast with a state of the law which, practically, puts the brand of servitude and degradation upon a large class of our fellow-citizens, our equals before the law. The thin disguise of "equal" accommodations for passengers in railroad coaches will not mislead anyone, nor atone for the wrong this day done. A State cannot, consistently with the Constitution of the United States, prevent white and black citizens, having the required qualifications for jury service, from sitting in the same jury box, it is now solemnly held that a State may prohibit white and black citizens from sitting in the same passenger coach on a public highway, or may require that they be separated by a 'partition', when in the same passenger coach. May it not now be reasonably expected that astute men of the dominant race, who affect to be disturbed at the possibility that the integrity of the white race may be corrupted, or that its supremacy will be imperiled, by contact on public highways with black people, will endeavor to procure statutes requiring white and black jurors to be separated in the jury box by a 'partition', and that, upon retiring from the courtroom to consult as to their verdict, such partition, if it be a moveable one, shall be taken to their consultation room and set up in such way as to prevent black jurors from coming too close to their brother jurors of the white race. If the 'partition' used in the courtroom happens to be stationary, provision could be made for screens with openings through which jurors of the two races could confer as to their verdict without coming into personal contact with each other. 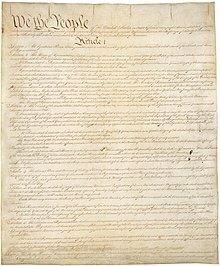 I cannot see but that, according to the principles this day announced, such state legislation, although conceived in hostility to, and enacted for the purpose of humiliating, citizens of the United States of a particular race, would be held to be consistent with the Constitution. Harlan's view, so lonely in its time, is now unquestioningly accepted. And in areas well beyond civil rights, his dissenting opinions proved far more durable and prescient than the court majorities. One Kentuckian stood apart and shines in the light of history... In case after case, Harlan stood as a lonely dissenter, urging the court and the nation to keep the promise of the Declaration and the equal rights amendment.